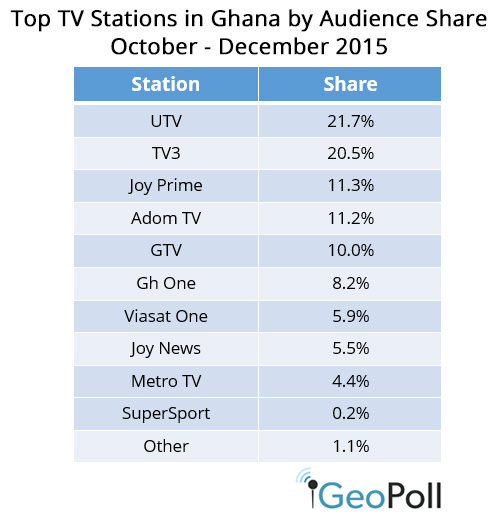 Using the daily data collected through Kantar-GeoPoll Media Measurement, GeoPoll has analyzed the top TV stations in Ghana and top TV stations in Nigeria for Q4 2015. We examined both TV ratings* and share** for the top stations in Kenya and Tanzania. To view more detailed data, filter results by demographics, and plan ad spend based on KGMM’s audience measurement data in Africa please contact us. In Nigeria GeoPoll measures TV consumption in 8 states: Abia, Edo, Enugu, Federal Capital Territory, Kaduna, Lagos, Oyo, and Rivers. 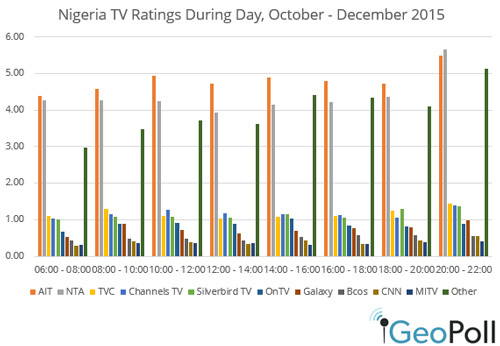 The below chart shows the average ratings for the top 10 channels in these states during the day from 6:00 to 22:00. 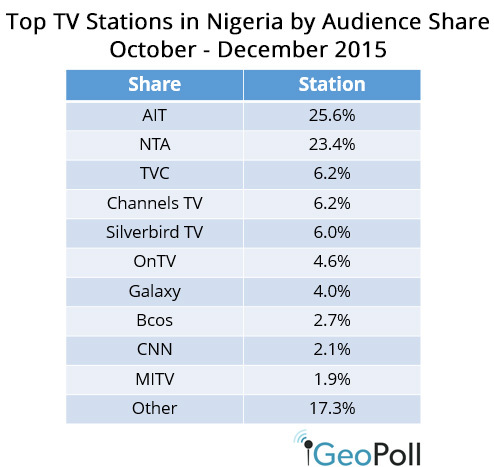 Nigeria boasts numerous TV stations that are organized by state and ultimately the high rating for “other” in the above chart points to fragmented viewership across the country. AIT and NTA have high ratings throughout the day, and AIT has higher ratings than NTA during most time blocks except 20:00 – 22:00 when NTA takes over. Channels TV and TVC compete for the 3rd throughout most of the day but Silverbird TV takes the 3rd position during prime time, between 18:00 – 20:00. Kantar-GeoPoll Media Measurement covers the entire country of Ghana, and measures ratings, audience size, and audience share of TV, radio, and print outlets. The below chart shows the average ratings in Q4 2015 for the top TV stations during the peak hours. The above chart shows that TV3 leads in the ratings from 19:00 to 19:30 when it airs its news show “News 360”. UTV has the highest overall ratings throughout prime time, with a strong jump in ratings from 8pm with an average rating of 5.54 at 8:00pm, 5.70 at 8:30 pm, 4.59 at 9:00pm and 4.38 at 9:30pm. 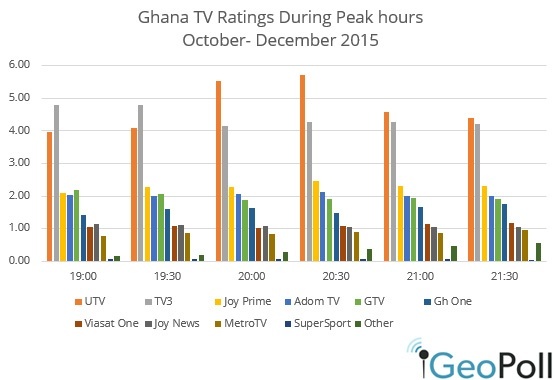 Joy Prime TV has the third-highest ratings for most of the evening, except at 19:00 when GTV has higher ratings.